Antique Empire Dore Bronze and Silk Frame with Fine Classical Motifs. 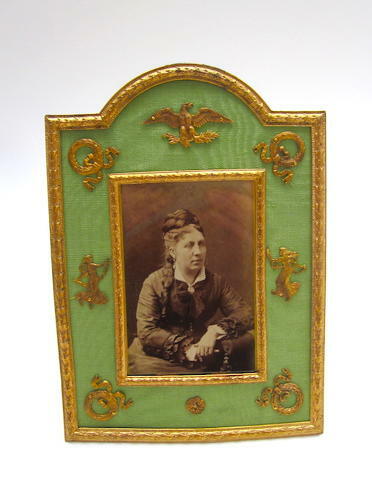 Antique Empire Dore Bronze and Silk Frame with Fine Classical Motifs and Original Antique Photo. The Silk is Adorned with Classical Empire Motifs such as an Eagle, Bows, Flowering Garlands and Classical Figures. Easel Stand and Green Moire Silk.